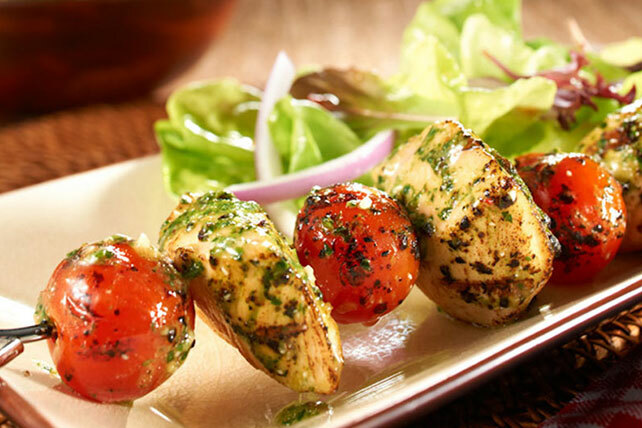 Whip up these Pesto Chicken Skewers in no time. Cherry tomatoes and Parmesan give these Pesto Chicken Skewers the sophisticated flavor you're looking for. Blend dressing, basil and cheese in blender until smooth. Toss 1/4 cup pesto with combined chicken and tomatoes. Refrigerate or freeze remaining 1/2 cup pesto for another use. Grill 5 min. on each side or until chicken is done. Toss remaining 1/2 cup pesto with 1/2 lb. hot cooked pasta.